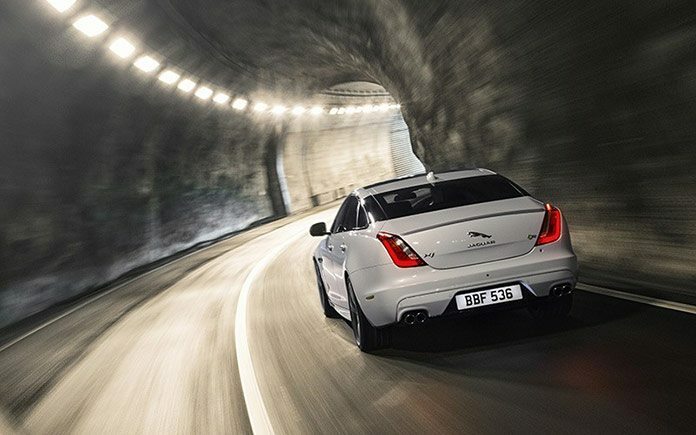 The XJ, Jaguar’s all-aluminium luxury saloon, is more desirable than ever. 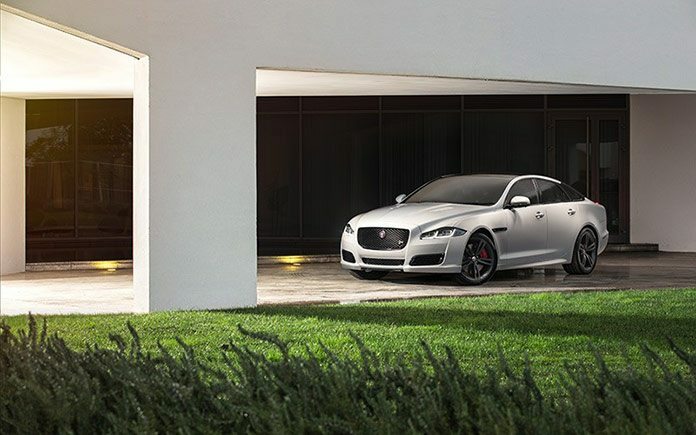 Subtle changes to the exterior design, accentuated by full LED headlights, add to the XJ’s already distinctive looks. 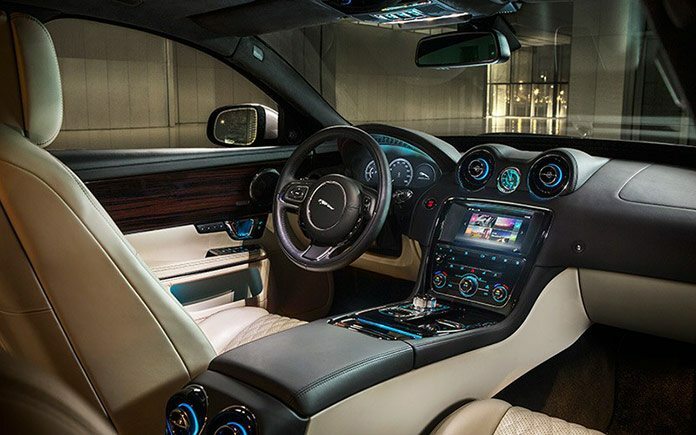 Materials such as semi-aniline leather and inlay veneers enhance an interior already considered the most luxurious in the segment, culminating in the new Autobiography model. “More dynamic and distinctive than ever, we’ve engineered our flagship saloon to deliver even greater levels of luxury and performance. The new Jaguar XJ features a larger, more upright grille, while sculpted chrome blades in the outboard air intakes emphasise the car’s mature, prestigious character. Twin ‘J-Blade signature’ daytime running lights are a unique feature to Jaguar XJ, befitting its status in the Jaguar saloon car range. The white light instantly and seamlessly changes to orange when the direction indicator is operated. The LED rear lights feature a new J-signature tail and position light graphic, making the Jaguar XJ even more distinctive. The rear bumper now features a gloss black valance and a slender chrome insert. Oval exhaust finishers complete the look. 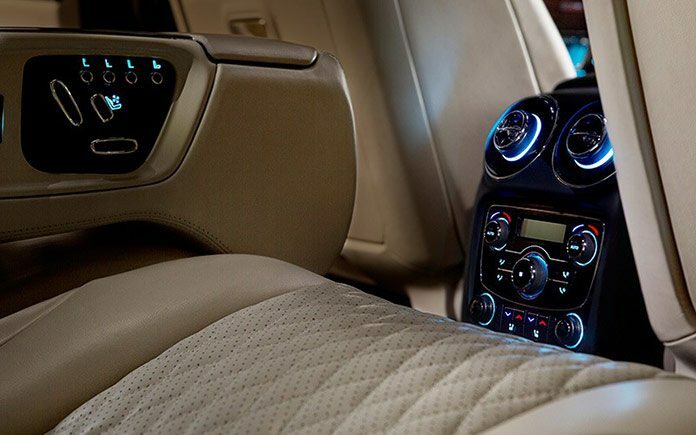 The XJ’s peerless interior design has been taken to the next level. So luxurious has it become that the outgoing Portfolio trim is now used for the Premium Luxury model. The new Portfolio gains quilted soft-grain leather seats with diamond stitching and embossed headrests, and figured ebony veneer. The Autobiography model, new to XJ in the 2016 model year and available only with the long-wheelbase body, can be identified on the outside by chrome front bumper air intakes and 20″ Mataiva wheels (Maroa in the UK). Inside, there’s a unique Autobiography Intaglio, quilted semi-aniline leather seats with contrasting stitching, a leather headliner, rich oak inlay veneer, and illuminated stainless steel treadplates, air vents and boot finisher. The new R-Sport model features a three-piece front splitter, deep side sills, side power vents and rear spoiler. A gloss black finish enhances the grille mesh, rear valance and, as standard in select markets, the window finishers. Wheels are 20″ Venom. The interior gains sports seats, R-Sport steering wheel and treadplates, Jet headliner and piano black trim. The new Jaguar XJ range will consist of: XJ Luxury, XJ Premium Luxury, XJ Portfolio, XJ R-Sport, XJR, XJ Autobiography. The powertrain range will consist of: 300PS 3.0-litre V6 diesel automatic; RWD, 240PS 2.0-litre petrol automatic; RWD, 340PS 3.0-litre V6 petrol automatic; RWD/AWD, 470, 510 and 550PS 5.0-litre V8 petrol automatic; RWD. Alongside the F-TYPE sports car and all-new XF saloon, the XJ is manufactured at Jaguar Land Rover’s Castle Bromwich Plant. The innovative parallel-sequential boosting system receives more aerodynamically-efficient turbochargers, while the primary turbo now features highly-advanced ceramic ball bearing technology: the reduced friction means even better launch performance and transient response because torque builds up even more rapidly than before. Engine efficiency is improved too. A switchable coolant pump and dual-stage oil pump ensure faster warm-up and reduced parasitic losses. And the exhaust gas recirculation (EGR) system now features a cooled low-pressure circuit in addition to the high-pressure circuit: this enables inherently low emissions of oxides of nitrogen (NOx) as well as reduced pumping losses across a wider range of the engine’s operating map. Complementing the improved EGR system is a selective catalytic reduction (SCR) system. Injecting a urea solution upstream of a highly-efficient SCR catalyst converts NOx into nitrogen and water, ensuring that the new XJ meets Euro 6 exhaust emissions regulations. The new XJ also offers the familiar range of all-aluminium inline-four, V6 and V8 petrol engines. All feature direct injection, variable valve timing, forced induction and intelligent stop-start systems to deliver high performance with remarkable efficiency. The 240PS/340Nm 2.0-litre four-cylinder benefits from a low-inertia turbocharger to match the driveability of larger naturally-aspirated engines but with improved fuel economy. The top engine option remains the 5.0-litre V8. Offered in 470PS/575Nm, 510PS/625Nm and 550PS/680Nm ratings, this exceptional engine delivers all of the performance promised by the XJ’s dramatic styling. All powertrains feature a specifically-optimised eight-speed automatic from ZF. Each has been developed to provide the perfect balance of unrivalled launch performance, shift comfort, dynamics and efficiency. Two variants of the 8HP transmission family are offered in the new Jaguar XJ: the familiar 8HP70 transmission and the lighter, more compact 8HP45. 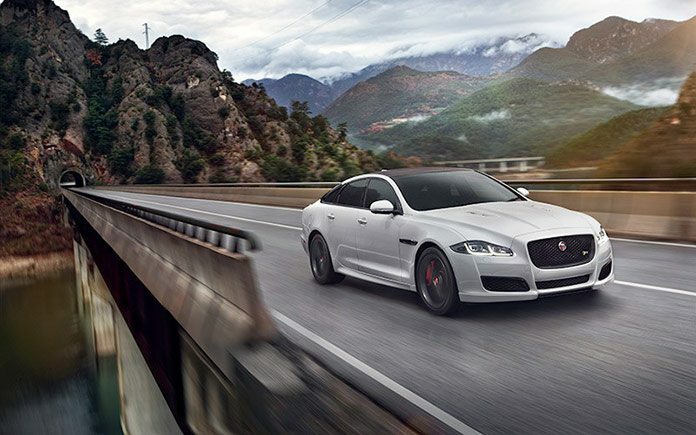 Jaguar cars set the benchmark for steering feel, in every segment. 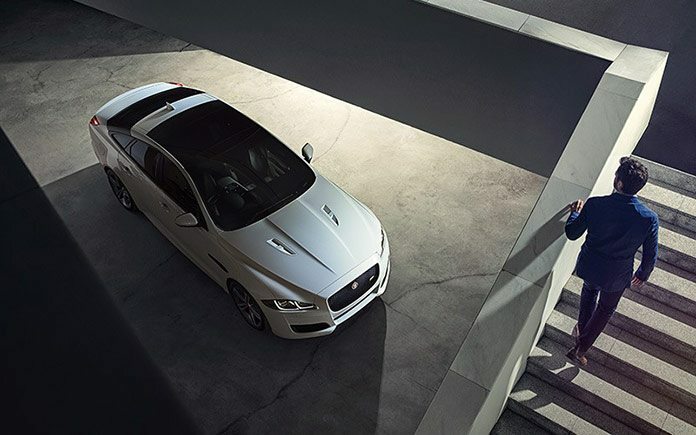 It’s intrinsic to the dynamics DNA of all models from XE through to F-TYPE. 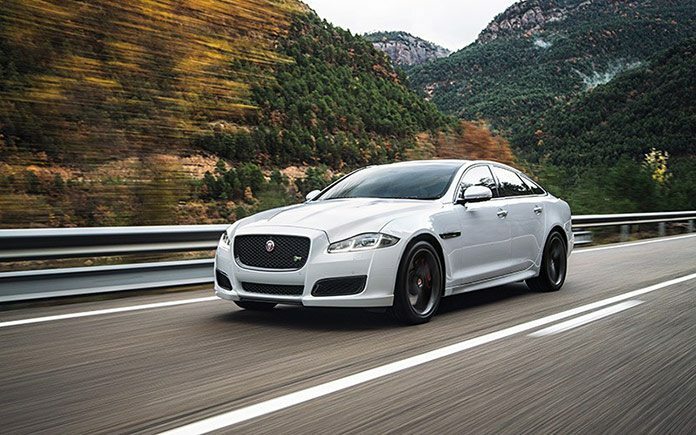 The Jaguar XJ is no exception, and this latest generation also benefits from the adoption of electric power assistance for the steering system: hydraulic systems have reached the limit of their potential. Years of development and testing, plus meticulous tuning work, mean that EPAS is now ready for Jaguar’s flagship saloon. The system’s ability to filter-out steering disturbances from poor road surfaces and compensate for road camber make the steering feel smoother and more precise than ever. Friction has also been engineered-out, improving steering feel and responsiveness still further. Unlike hydraulic systems, EPAS only uses energy when the driver turns the wheel, so the reduction in parasitic losses helps to reduce fuel consumption by up to three per cent on the European combined cycle. Designed and developed without compromise, the new XJ’s InControl Touch Pro premium infotainment system is truly state-of-the art. Conceived in-house and built around a quad-core Intel processor, 60GB solid-state drive and a next-generation Ethernet network, InControl Touch Pro can handle massive amounts of data and is exceptionally powerful and responsive. At the same time, the system is simple and intuitive to use. At its heart is an eight-inch capacitive touchscreen. Just like a smartphone, the home screen can be customised – there’s a choice of wallpaper images, while widgets can be used to shortcut to favourite features and functions. Extra home pages can be added, if desired. And just like smartphones, the touchscreen accepts ‘pinch to zoom’ gestures, for instance, or swipes to scroll between home screens. This simple, intuitive user interface helps drivers to keep their eyes on the road, minimising distraction. The functionality of the navigation system is just as impressive. Maps stored on InControl Touch Pro’s solid-state drive can be accessed in a fraction of the time needed with conventional hard drives. Dead-reckoning functionality accurately determines the vehicle’s position even when GPS signals cannot be received – ideal for cities. InControl Touch Pro also enables door-to-door route planning and guidance, including public transport options. A companion app allows you to plan your route offline and then load it into the system at the start of the journey. The system also offers a Commute Mode: this learns your daily drive and can automatically offer alternative routes to avoid congestion using historical and real-time traffic information. Approach Mode displays a 360° interactive view of your destination as you get to within 200m, and can even direct you to the nearest available car parking space. InControl Touch Pro also delivers a full-screen navigation display in the new XJ’s reconfigurable full TFT instrument cluster. Equal attention has been paid to audio system performance. The new Jaguar XJ offers four digital systems including the outstanding 26-speaker, 1,300W Reference sound system developed with British audio experts Meridian. The 17 channels of stereo and surround sound benefit from Meridian’s Trifield technology to ensure optimum reproduction with benchmark low levels of distortion. Gracenote images stored on the solid-state drive enrich the experience, while functions such as ‘Play more like this’ make it easier still to access all of your favourite tracks. 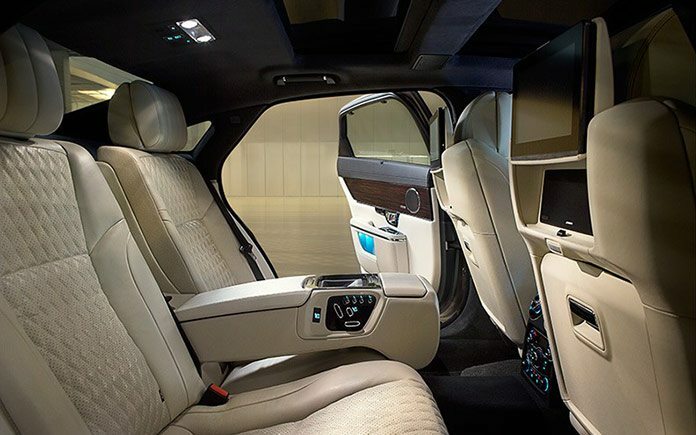 To further enhance the XJ’s luxurious row-two experience, customers will be able to specify a rear seat entertainment system. Comprising two 10.2-inch high-definition screens which fold away when not in use, these displays offer a true 16:9 widescreen aspect ratio. When digital TV is also specified, a different channel can be shown on each screen and an additional 100GB of user media storage is provided. The rear seat entertainment system will also allow passengers to connect devices using two USB 3.0 ports, one HDMI and one MHL port, enabling charging and media output and from a wide range of smartphones and tablets. The new XJ is the latest Jaguar to offer InControl Apps, an innovative, intuitive technology that enables customers to seamlessly connect Apple and Android smartphones to the vehicle’s infotainment system, via a USB cable. InControl Apps provides access to compatible apps on the device using the vehicle’s touchscreen. Remote Essentials, accessed through the InControl Remote App, enables customers to connect with the new XJ using their smartphone, so they can check how much fuel is in the tank, whether the doors are locked and if the windows were left open. Remote Premium, also accessed using the InControl Remote App, does even more, enabling the driver to remotely lock or unlock the car and receive alerts if the alarm goes off. Should the driver forget where the car is parked there’s a map to lead them straight to it. Remote Premium can also enable the driver to bring the cabin to a pre-set temperature by remotely starting the engine using their smartphone: at the press of a button the climate control system can heat or cool the interior to the desired temperature. 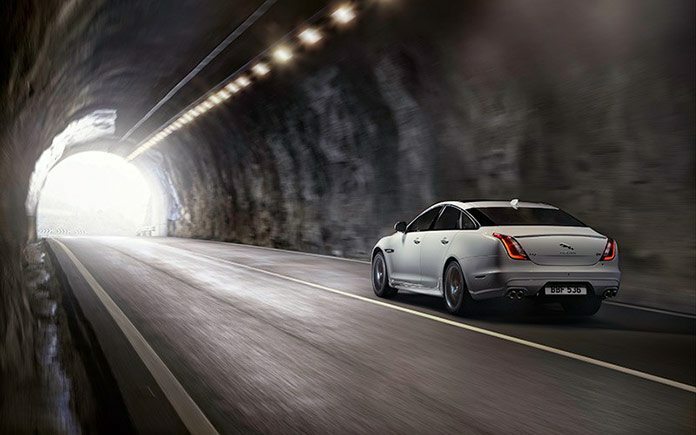 Using the vehicle’s antenna for the strongest, most reliable signal, the new XJ can function as a Wi-Fi hotspot, providing a connection for up to eight devices. InControl Secure provides proactive vehicle monitoring: should the new XJ be stolen, the tracking service will work with law enforcement agencies to locate and recover the car as quickly as possible. Should the car be involved in a collision severe enough to trigger the airbags, InControl Protect will automatically notify the emergency services and provide the vehicle’s GPS location. Occupants can also trigger an emergency call manually simply by pressing a button. 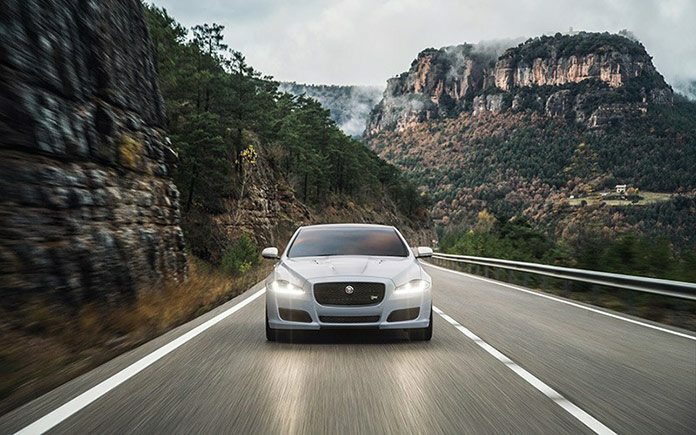 Already proven in the XE and the XF, the new XJ becomes the latest Jaguar to benefit from the revolutionary All-Surface Progress Control (ASPC) technology. Designed to help drivers to pull away smoothly and without drama on very low friction surfaces, ASPC is a unique system which can make it easier and safer to drive a powerful rear-wheel drive car at low speeds on slippery surfaces such as snow, ice and wet grass. Conventional traction control systems attempt to modulate what happens once the wheels begin to slip – that’s usually too late. ASPC is fundamentally different, and leverages decades of Jaguar Land Rover’s knowledge and experience in off-road technologies. ASPC works like a low-speed cruise control and can operate between 3.6km/h and 30km/h. The system is activated by pressing a button on the centre console and then the driver uses the cruise control switches on the steering wheel to set the maximum speed. After that, ASPC does all the hard work: the driver just has to steer. What makes ASPC so effective is that it doesn’t just provide fine control of the throttle: it also uses the brakes in opposition to the throttle. So from a standstill, only very low engine torque is applied to the driven wheels, enabling smooth progress with little or no wheel spin. ASPC is compatible with rear- and all-wheel drive and is made even more effective by the fitment of winter tyres. The traffic sign recognition system relies on a forward-facing camera to keep the driver informed of speed limits – including temporary limits which may be in force through road works, for example, and variable limits on motorways. Camera data is compared against GPS data, enhancing accuracy and robustness. The new queue assist function for the adaptive cruise control system has been designed to take even more of the effort and monotony out of driving in heavy traffic. Using a long-range radar sensor, the system can now maintain a safe distance from the vehicle in front, all the way down to a standstill. Building on the safety benefits of blind spot monitoring, the closing vehicle sensing system uses radar sensors and has a far greater range. The system can alert the driver to the presence of vehicles approaching fast from behind when changing lanes by displaying a flashing icon in the door mirror. The adoption of electric power-assisted steering enables the new XJ to offer semi-autonomous park-assist functions for both bay and parallel parking. Ultrasonic sensors measure the space first and, if it’s long enough, the system enables the car to manoeuvre itself into position – and, in the case of parallel parking, out again. The driver just controls the accelerator, brakes and transmission. The Jaguar XJ also features a surround camera system: four cameras combine to give a 360° view of the area around the car to make manoeuvring easier and safer. The XJ’s radar sensors can also help to make reversing safer. Vehicles approaching from either side are detected and, if they present a potential hazard, the driver is given audible and visual warnings.